Secret # 1: I never crave soup. Secret #2: Potatoes are not my favourite ingredient. Sure they make awesome fries, but other than that I always find them bland, boring and beige. Three of my least favourite adjectives. Secret #4: After taking the photo below ↓ I not only polished off both bowls of the soup but managed to squeeze in a third. Soup obsession. Potato soup doesn’t judge. Secret #5: I now always crave soup. Yes, it’s sadly true, I pretty much devoured a good portion of this soup before it was even dinner time. I quickly turned into a couch potato… a potato soup couch potato. This is a smooth, luscious, warming from the inside out, perfect fall soup. Just what I need when it’s already dark at 6pm (grumble). After making this creamy vegan potato soup I declared that from now on, I am going to make soup. All the time. Like every single day. I went from someone who felt “meh” about soup, to someone who feels “give it to MEEEEEE” serious about soup. That’s pretty serious. I think maybe it’s the pure simplicity of this soup. Just veggies, broth, non-dairy milk, and a little salt. It’s really all you need. So clean, simple, and scrumptious. 3 great adjectives! 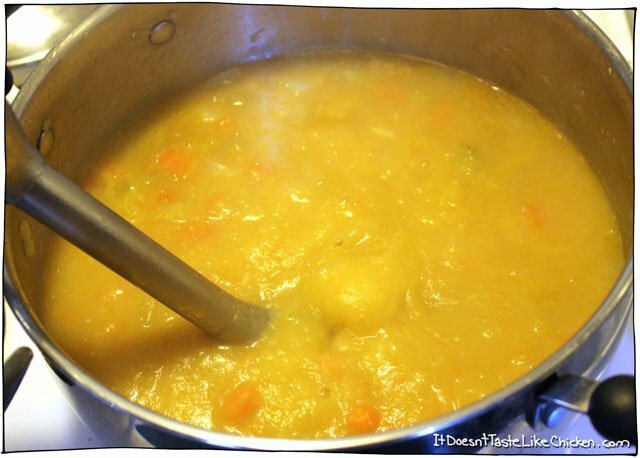 To make Creamy Vegan Potato Soup: Roughly chop up the onion, carrots, celery, and potatoes and garlic. Heat a large pot over medium-high heat, and add the olive oil. When it is hot, toss in the celery, carrots, and onions. Sauté the veggies, until they start to look a bit caramelised and delicious. Add the garlic and sautée for one minute more. Add the potatoes and veggie broth. Cover and simmer for about 15-20 minutes. The soup is cooked when a fork easily pierces all the way through the veggies. 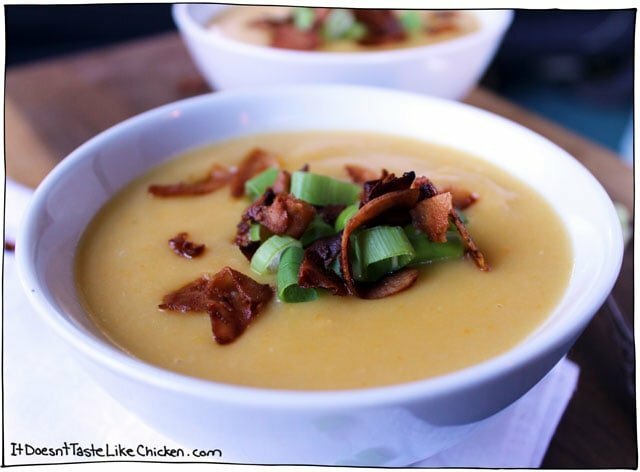 Blend up that creamy vegan potato soup up! Use an immersion blender straight in the pot. Blend until it is perfectly smooth. If you don’t have an immersion blender, you can carefully scoop some soup into a standing blender, and blend in very small batches. Remember to not fill your blender up too high or you will have a hot soup explosion! I like my soup creamy and silky, but if you prefer some veggie chunks in yours remove some of the soup, blend, and then mix the two back together again. Stir in the coconut milk or non-dairy milk of choice. Taste, and add salt according to your preference. 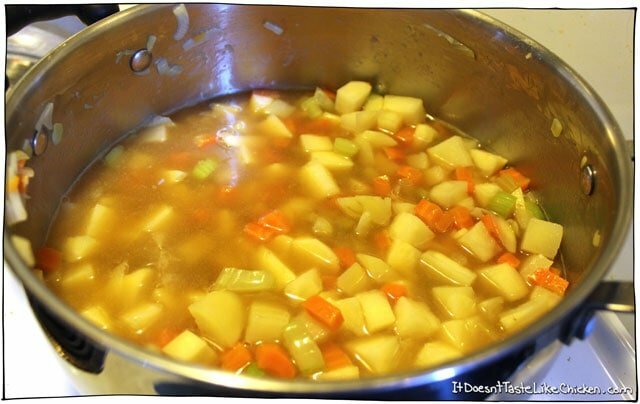 This will vary depending on how salty or not salty the broth you used is, so just add a little at a time until you think the taste is perfect. I ended up using 1.5 teaspoons of salt. Heat the soup until simmering and you are ready to serve. Sprinkle on some delicious toppings, if you are into that kind of thing (you should be into that kind of thing), and try not to become a potato soup couch potato. Quick and easy to make, this soup is so simple but so tasty you won't be able to stop eating it! Heat the oil in a large pot over medium-high heat. 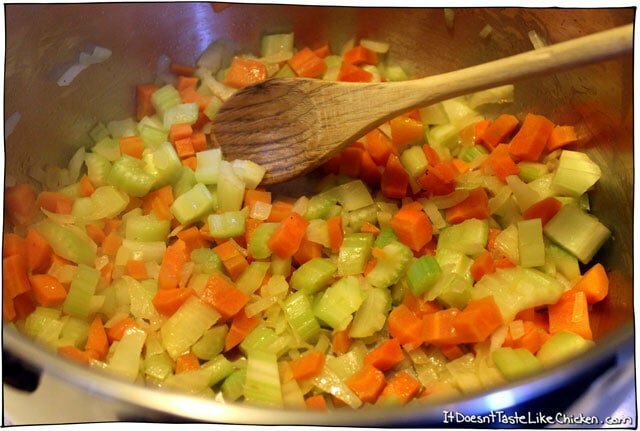 When hot, add the celery, carrots, onion, and garlic. Sauté the veggies, until they soften and begin to brown. Add the potatoes and veggie broth. Cover and simmer for about 15-20 minutes, until a fork can easily pierce all the way through the veggies. Once blended, stir in the coconut milk. Salt to taste. Serve hot with optional toppings of choice. I was looking for a potato soup recipe and so glad I found yours. Every recipe I’ve tried of yours is always amazing. I had everything but celery on hand, so I made the soup without it. Everyone loved it and will definitely be made on a regular basis. I was worried the coconut would mess with the flavor, but I didn’t even catch a hint of coconut….just yummy potato. Loved it! I can’t wait to get home tonight to eat leftovers! Delish! A good blender will always help make the soup a lot smoother. The graininess could be coming from the potato if you are using a different type. Difficult to know without being in the kitchen with you. Try blending it longer. Enjoy! I think it’s time for me to invest in a good blender 🙂 Thanks for the tip! You’re most welcome! My favourite is Blendtec blenders. I subscribe to Imperfect Produce and received a lot of potatoes of various sizes and types for a few weeks. Some have even bloomed so I was desperate to cook them.. Had the brilliant idea to make potatoe soup…of course! Internet search led me to this recipe. OMG!! So creamy!! So delicious. Best soup ever. Didn’t need the coconut milk. Recipe was so easy, easy, easy to follow!! Will do this again and again!! thank you!!! You’re most welcome, Carline! Thrilled you enjoyed it so much 🙂 You’ll find lots of easy recipes on my site. I’ve made this recipe a few times now, and I’ve changed it in a few ways. I added green onion or shallots, and instead of regular vegetable broth, I’ve been using a vegan protein broth made with legumes I found at Wal-Mart. It is a creamy, opaque broth and it really adds something to the flavor, as well as it makes this soup a source of complete protein. This is my favorite soup and I think anyone would love it! I’ve made this a few times and last night was the best version thus far. 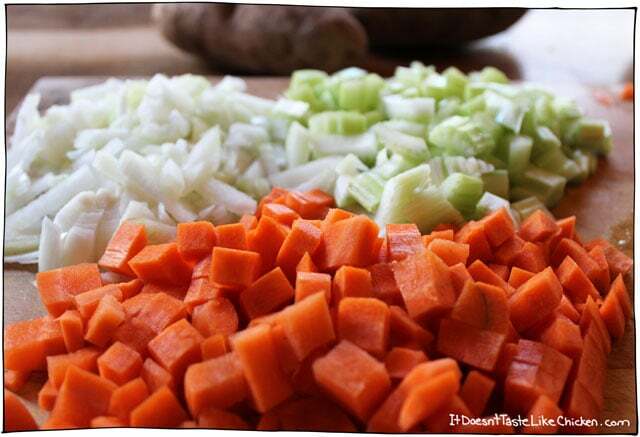 I did make some changes – I added about 2/3 cup of diced carrots and extra celery. I also didn’t use any oil – instead just a little water to the pot. I used baby red potatoes with skins – about 12-15? And I probably added extra garlic. 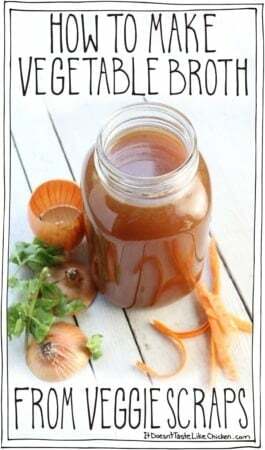 I also used veg better than boullion – 2 to 3 teaspoons and 3 cups of water. While the vegetables were cooking I also added 2 teaspoons of smoked paprika. And threw in about a half-cup of frozen corn. I threw a few cups in my ninja at the end because we prefer chunky soup/chowder. My son is a verrrrry picky eater and he loved this. I served it sprinkled with black pepper. 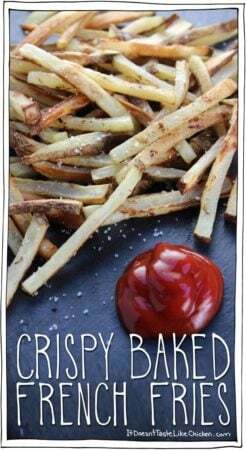 I made this recipe last night and it is so delicious! I used almond milk instead of coconut milk, but everything else was exact. The longer you saute the veggies the better the flavor in the soup. Fantastic! Just made this for dinner and followed the recipe as is and it was soo bland. I just kept adding spices until it finally tasted good. Sorry, you didn’t enjoy it, Hannah. You definitely want to make sure you add enough salt as potatoes love salt. Hope that helps! This was delicious. Even my picky Omni hubby liked it. Quick tip. Chop your veggies (except the potatoes) in the vitamix on pulse. Fastest recipe you’ll every throw together. I have 2 soups I make on a regular basis now. Thank you! Secret number one: we shouldn’t have to scroll through a novel’s worth of text to get to the recipe.. Just post the recipe! Secret number two: it took you 10 times longer to leave that comment than it did for you to scroll past the text to the recipe. I made this soup just now and it is totally amazing. I can’t stop eating it either. I had to do the blend in small batches trick, and it is a little chunky but soooo delicious. I can’t wait to share with the family. I am trying to convert my family to a vegan (I’ll even take vegetarian) way of eating, and we had this for dinner tonight. HUGE hit! Thank you! Although, we are not vegan or vegetarian just dairy free; this recipe was fantastic on a cold snowy day in Wisconsin. I adapted the recipe for my Instant pot. I also added 1/4 c nutritional yeast, smoked paprika, and added steamed asparagus after pureeing the soup. We did add bacon. My 7 year old added chipotle peppers to his. He loves all things spicy. Thank you for a great recipe. So happy you loved it, Jennifer. Out of celery (oh, the horror! ), subbed red onion for yellow, as my yellows decided to sprout (how rude). Added handful of dehydrated leeks and served sprinkled with a little celery salt. 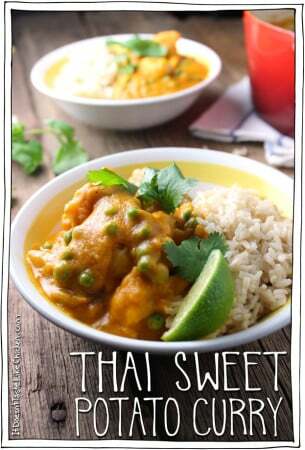 Delicious with and without the coconut milk! Thumbs up from all 7 of us! Husband insisted that its only missing a bacon crumble garnish. I’ll make this as brief as I can! My wife is the primary cook in our house and I would (confidentially) describe her as “fussy”. This goes back even before our family became vegan overnight (August 2015). Yesterday I said I wanted to try to make THIS soup recipe. Her reply was “I don’t like creamy soups. Never have, never will.” Well…never say never. Yesterday was batch #1.Today is batch #2! We’ve used your recipes before and have never been disappointed. This was a home run for sure. I mean if a creamy-soup hater gives it a 5 star rating…..nothing more to say! Thanks and keep up the great work. Delicious! Used the coconut milk. It was rich, creamy and tasty! Thank you for the recipe! This was perfect! I used about a cup of frozen mixed veggies to get a little more nutrition in. I grew up on creamy potato soup but I don’t like all the dairy in it now so this was a great find! Even better because the coconut milk makes it slightly sweet. This was so good!!! Thank you for the recipe. I’ve found that using the immersion blender or the food processor on potatoes makes them gummy and gross. How do you avoid this? Thank you. Use russet potatoes! Not all potatoes are alike, but russets are dry and mealy meaning they won’t get gummy. Thanks! I doubled this recipe, added several tablespoons of nutritional yeast, a teaspoon of smoked paprika, and only one can of coconut milk as well as an extra cup of vegetable broth. Very tasty. I like my potato soup only partially blended so there’s still something to chew on. 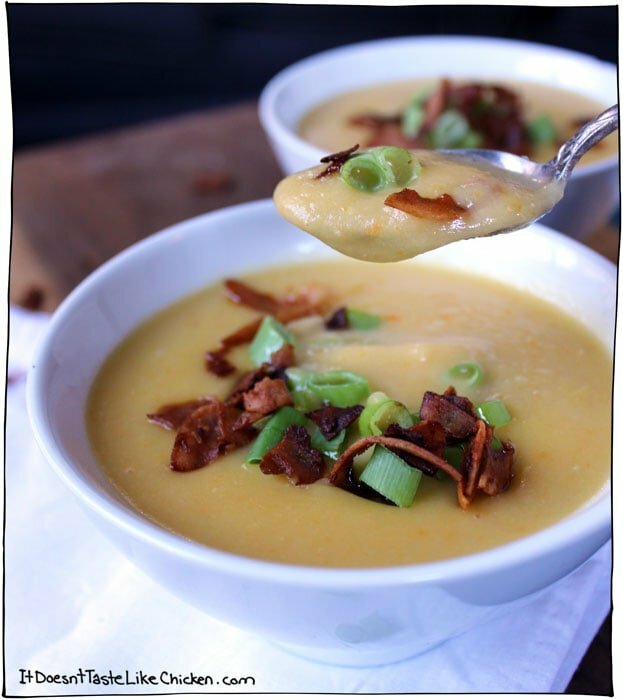 Oh-so-tasty vegan potato soup! I added a dash of hot cayenne to give it a kick. The thing I love about this recipe is that it’s simple–from the ingredients to the preparation, it’s not daunting and is easy to follow and customize. I made mine thicker, more like a chowder, and used almond milk for a low fat dish. Really great recipe, thanks for posting! This soup was perfect for the entire family. It’s hard to get everyone to agree on somehting as I have a picky husband and 2 toddlers. This recipe made the rotation! Hallelujah!! Something we all liked!!! Thanks! I absolutely adore this recipe! I can’t even begin to explain how since I’ve made it I find myself craving it during all times of the day and it was so easy to make! Much like I already do with my regular mashed potatoes I added some vegan mayo to get it a bit or a silkier taste and I don’t think I can ever go back!. Where did you find vegan mayo? 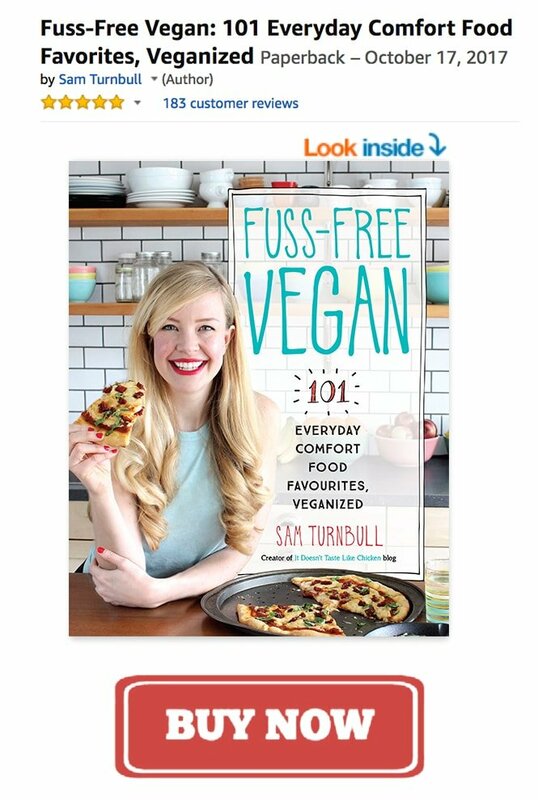 There are different kinds in the grocery store such as Vegenaise brand or Hellmann’s vegan mayo, or I also have a recipe for Mayonnaise for Days in my cookbook Fuss-Free Vegan (page 208). Wow! Delicious! I baked the peelings from the potato and added it as a garnish. Thanks for the great idea! All this time I’ve been throwing away my peels. The peels were delish! Yummmm very good. I added in a swede and a bit of cauliflower. The swede goes very nicely with coconut milk. This is my go-to potato soup or late Sunday evening and it’s dang cold out soup now! Every time I make it, it tastes a little bit different and better. Even my omni husband loves it, as does the dog who gets to lick the pan after it is all eaten with leftovers in the fridge. Thanks for the recipe! Hello. Found your website today and ended up making a double batch of this soup. Delicious and filling. Have book marked your site and can’t wait to try some more of your recipes. Thanks for the great blog and recipes. Hi, Can this soup be made ahead and frozen? I plan to make it for house guests arriving later in the week and like to get as much done ahead as possible. Thank you. Potatoes can get a grainy texture after being frozen, so it might not be the best. You can definitely make this soup several days ahead of time, however, and just store it covered in the fridge covered, then heat when ready to serve. Hope that helps! This soup is fantastic!!! It will be a staple for sure. It was very easy to make and I too found myself constantly taste testing. Simply delicious!!! So good! I used one more potato and a cup of water. It was so creamy and so delicious. For a flavorful stock, I like making Japanese shiitake dashi. Adds umami. I also use vegan mushroom granules for flavor. I’m not 100% vegan but some of my friends are and sometimes I just want veggies. Oh, some celery seeds add a nice flavor, too! Thanks!!! I really love this soup! 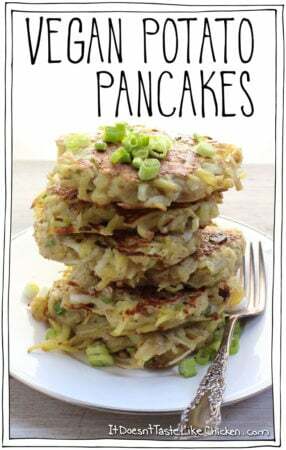 Thanks so much for the recipe – it’s become a staple for us when we do the Daniel Fast. I made this today! It was so delicious! I added corn because I was in the mood, and I also added a baked potato that I had made the night before and it was left over. I didn’t add the coconut milk because it was very creamy after I blended it. This was so delicious! I had two heaping bowls and want more but I will burst! Thank you! Can I sub gold potatoes for idaho potatoes? Absolutely, the texture of the soup might be a little different but it will still be delicious. Enjoy! So Amazing I had to post! I didn’t have a blender and I forgot the veg. stock so i used chicken broth and it took about 2hrs for everything to get soft enough to mash with cooking spoon. It came out pretty chunky but the flavor was so amazing I didn’t even have to add milk Or seasoning! 10 minutes later I’m on bowl #2! So happy you enjoyed it Ash! I literally just finished making this soup. If I don’t stop taste testing it there won’t be anything left for dinner! It is surprisingly flavorful for having very few ingredients. 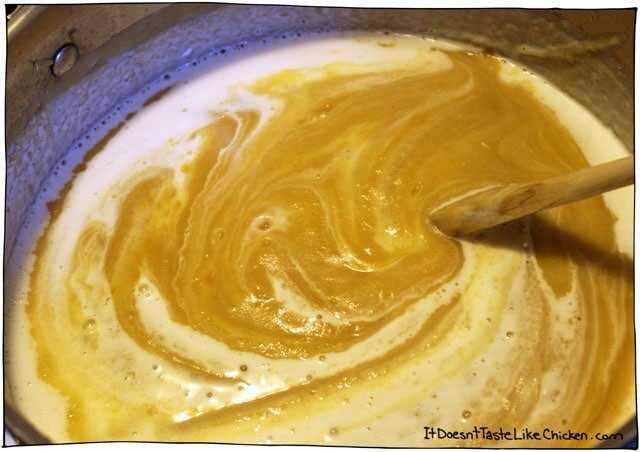 I used the coconut milk – if I didn’t know better I would guess I was eating potato cheddar cheese soup. SO GOOD! Glad I fell upon this recipe! Thanks for sharing! Two Thumbs up!! Great recipe! I skipped the celery and used white potatoes. It was so satisfying, I don’t even miss the cheese from my old “potato cheese soup” days (which I think is due to the added almond milk.) My only hiccup was using the immersion blender. Although it’s usually fun and easy, this time I ended up with a lot of splatters on my shirt. Next time I may try a few pulses in the Vitamix. Thanks Sam! It’s that time of year again and this soup is so satisfying, again! This time I kept the immersion blender in the soup (instead of bouncing it up and down) and there wasn’t a single splatter. Thank you Sam! This soup is becoming a big hit all around the world – at least in the Netherlands were I’m from. 🙂 I made this last night and now I’m a fan too. Thanks for sharing. This soup is fabulous! I have made it twice and look forward to making it again! Hi, you are so right about craving this soup. On my second batch. I suggest using good vegetable stock. I used a Wal-Mart brand for my second batch. It tastes ok, but not like my first batch and the consistency isn’t as creamy. But I love the recipe. Thank you for sharing. Oh yea, I am not vegan or vegetarian, but am trying to be gluten and dairy free. I made a double batch and the whole family loved it. Will def make this again. ‘Twas the bomb! This soup was delicious! I don’t like soup in the summer, but due to dental work I will be eating soup and smoothies for a few weeks. 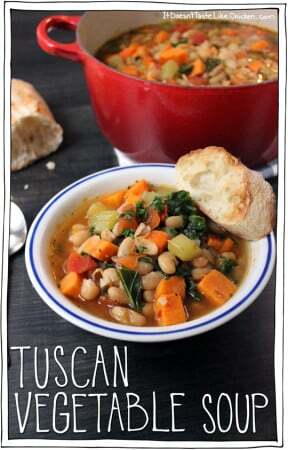 Made a double batch of this, adding a drained can of white beans to the pot before hitting it with the blender. It was delicious, and was so velvety and decadent feeling. I’m not sure if I’ll become a summer soup convert, but if I do, this recipe is the reason why! I don’t know why so many think soup is for winter. If you have a hot meal in the summer you think nothing of it, but if you serve hot soup you get comments. My daughter-in-law reserves her tomato soup for cold, rainy days. I would love it spring, summer, fall and winter. I see no difference in eating soup or eating mac and cheese, as far as temperature goes. They’re both served hot. I love this soup recipe and made no changes. Made a double batch thinking I would freeze the rest. Left the milk out completely because this was so rich and creamy all by itself! 4/5 family members LOVED it. And I loved giving them a good plant based meal. Couldn’t freeze any as we had one bowl for leftovers the next day. Thank you for such a great recipe! Mid soup prep as I type and I am hesitating, is the coconut milk going to give me the glorious texture at the cost of too rich a coconut flavor? Or should I just stick with the thin and lame unsweetened soy milk? Go for the coconut milk! I find the coconut flavour is gone, or subtle at best. Thanks for this delicious recipe! Just made it for my family tonight and everyone loved it! 🙂 We used cajun spice and nutritional yeast as toppings…yum! Very tasty! Thanks for the recipe! So… 🙂 Coconut milk in a can like one can find in the ethnic food sections or the coconut milk that is now in cartons in the milk & creamer sections? The one in the can is either regular or lower fat but are both pretty thick. I think it will make a difference which kind is in the soup… which did you us? Thanks! The coconut milk in a can! Really you could use either, but I recommend the canned version as it will make your soup gloriously creamy. That’s what I use and I love it. I just finished making this soup and it is fabulous! Yay! So very happy you love it as much as I do Deb! I made this soup last night and I’m in love! It was so easy to make, and it turned out so creamy. I added some balsamic vinegar and paprika and it was heavenly. You’ve turned me into a soup convert! I’ve always despised soup (was made to eat it every day growing up by my parents so I developed a justified hatred for it) but I think this recipe was the beginning of a great love story between soup and I. Thank you! This is SO good! I added 1/4c nutritional yeast for a cheezy flavor. So happy you loved it Cayla! The nutritional yeast addition sounds awesome! Would using white potato be just as good, or should I stick with russet? Russets are best, because they break down to a nice smooth texture. Other potatoes will work of course, but because of the varying amounts of starch, it can have a stickier quality to the soup. Hope that helps! What did I do wrong? It was more yellow and tasted nothing like potatoes. I followed the recipe exact except to put in 1 extra potato because I like potato soup. I used the coconut milk. I salted a bit at the end. Now the coconut bacon? Oh yes!! That was excellent! But I’m not sure I’ll even keep the leftovers of the soup. Oh no! That’s terrible. I am not sure. The soup is pretty yellow (like in the pictures), and it should be creamy and delicious at the end. I have no idea what could have gone wrong, but I am so bummed it didn’t turn out for you. I’m glad you enjoyed the coconut bacon! For something so simple, this was a tasty soup. I will make this one again. Thank you! I just made the potato soup for the first time. O.M.G! It is amazing! Best soup, no make that best dish, I have ever made. Aww that’s so awesome Bill!! Thank you 🙂 So happy you love it so much. That’s the best ever! 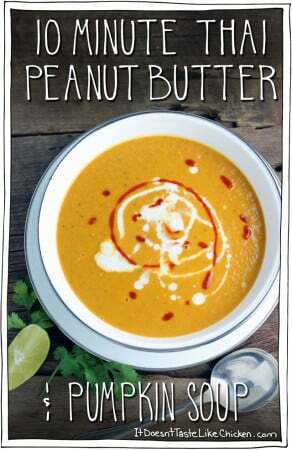 We make a few yummy soups (we <3 soups! ), but Potato was one of our favorites when we were not vegan. I asked the squad, "How can we make it VEGAN!?" They mentioned switching out the milk for coconut milk and suggested we research it tonight. Searched "Vegan Potato Soup" and was directed here. After these reviews we are definitely excited to get our potatoes tomorrow! "Best soup, no make that best dish…" What!? Awesome! and in beginning I was always looking for inspiration! Its very nice put this information out there, specially in a so much beautiful and caring website…make people see that “meet” is not necessary for a great meal! This was really tasty! I used almond milk and also kept some of my soup chunky. Thanks for the recipe! Excellent recipe! I added a little smoked paprika & it gave the soup flavor like bacon would. Thanks for posting this recipe! This is now my FAVORITE soup of all time! I can’t get enough, and neither can the 1 and a 1/2 year old, which is just fantastic when you see all of the beautiful vegetables that go into this simply perfect concoction. Thank you Sam!!! Well now I know what I’ll be making for dinner tomorrow! And lunch! And snack! Cuz this looks DELISH! Invite me over to your house, Connie! Potato soup day! hahaha! Potatoes are so so boring… *WITH* the exception of fries, hashbrowns (fast food disgustingness only; keep those wimpy soggy sautéed ones away! ), a really unhealthy creamy gratin-type dish, and yes.. potato soup! 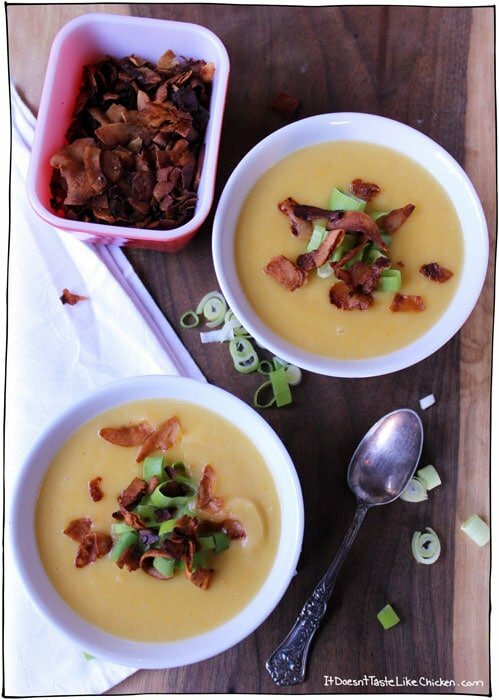 Potato leek soup is like my favorite thing of all time, just in general, and this looks like it needs to be added my repertoire. Pronounced “reh-peh-twah” for good pretentious measure. 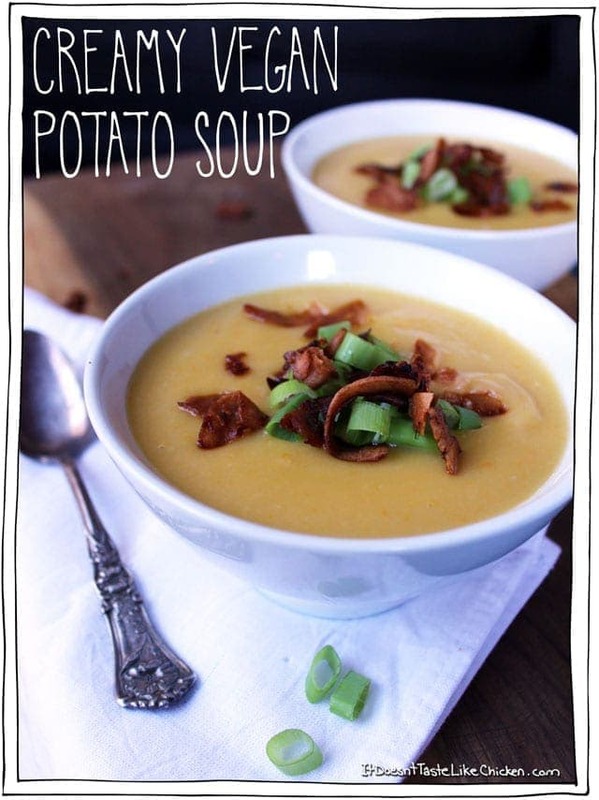 Bonus points because that’s the super wrong way of pronouncing it, too… YAY POTATO SOUP! hahaha! You crack me up Cheryl! I know! Potatoes… so bleh unless they are smothered in everything fatty! I love leek and potato soup too, but I almost never have leeks on hand, so that didn’t happen. Haha. I am definitely going to add more soups to my reh-peh-twah as well! Soup is the best and I crave it every single day. I even like cold soup! Oh no, no cold soup!! Bleh! That’s too far for me, as you know! Haha.